Pandit Sandip Bhattacharya is one of the most experienced Indian musicians (tabla, vocals, composer) in Europe. 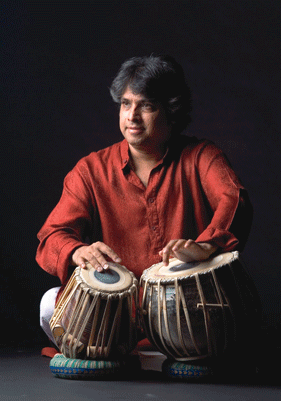 As tabla master, he is known for his collaboration with Pt. Hariprasad Chaurasia, Lakshmi Shankar, Pt. Budhaditya Mukherjeeand. He has become famous also outside India with Mari Boine (Norway), Mola Syla (Senegal), Eric Vloeimans, Ernst Reisiger, Eric Morel Vaarzon. He played on many big international festivals and at the Dutch Royal House. Sandip is a very good singer and he enjoys his good reputation in the European world music scene, the Indian musical life as well as in the traditional mantra singing. In the past 20 years Sandip has given numerous masterclasses and workshops. He is a popular and respected teacher/guru and he has many students around the world, who successfully go their own way and distribute their music.